knit from cotton that is a varigation of purple, cream, and sage-ish green. 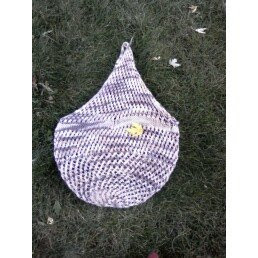 Though it became the bag that kept on growing... but knitting on pain meds is often like that. lol I can carry my laptop in it, along with several other books and some knitting in it...with a picnic lunch! I am happy with the result and even indulged in some public knitting.